There are a lot of dining options in Oak Park. One of the best, without question, is the Marion Street Cheese Market. Don’t let that name mislead, it’s much more than cheese and much more than market (but Marion and Street are what you would expect). It’s a few blocks south of the main drag just across from the el tracks, don’t skip it. It’s a market and a restaurant and a wine bar and pretty much anything you want it to be really. On this fine Friday last, with my wife and mother-in-law for lunch, I dined near people on business lunches, couples on dates, groups on celebratory occasions, and singles. The people, like the food, run the gamut. It was a Lenten Friday also so it was refreshing to see over half of their sandwiches were veggie options. As usual, I got the coolest thing in the group, the goat cheese sandwich. It had a layer of goat cheese on toasted bolillo bread with a generous helping of celery root slaw, a few handfuls of roasted grapes, and some spiced walnuts. It was great, but difficult to describe. The bread was much softer than it looks. The fear with a baguette-style roll and messy sandwich ingredients is that the eater has to exert so much pressure to get through the crispy outer shell of the bread that the ingredients get squeezed out and end up on the lap of the eater. Not so here; the outer shell was crispy but super thin, so it wasn’t chewy. I chomped down and got a little crisp sensation then smoothly flowed through the warm bread and the moist ingredients with hardly any side flow. They have the physics figured out for sure. 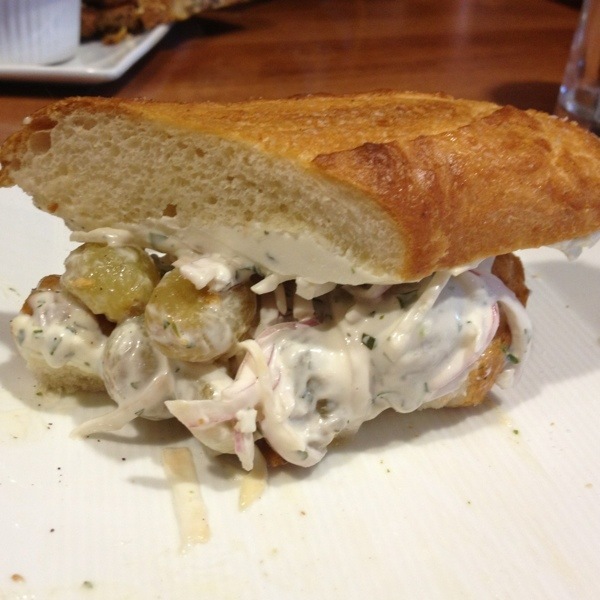 The celery root provided a nice offset to the creaminess and gave the sandwich some texture, the roasted grapes added a burst of sweetness, and the walnuts provided an occasional crunch. I devoured this thing. This sandwich allowed me to reflect a little on my sketchy food history. I remember a time, maybe within the last decade, when the idea of grapes, raisins, or walnuts in a salad-style sandwich filling was a non-starter for me. I would look with disdain upon chicken salad with raisins. I would utter things like, “Fruit, on a sandwich? Uh, no!” It even carried over to other foods. I didn’t want raisins in my cinnamon rolls or apples in my pie. I was emphatic on this. In fact, I’m just as emphatic now regarding the desire for that burst of chewy sweet in my food items. My favorite cookie is my wife’s macadamia, white chocolate, and cranberry cookie. Heck, I hate white chocolate, but it’s transformed when added to a crunchy cookie with generous amounts of cranberries – what a combo and what a surprise. This sandwich from the Marion Street Cheese Market had the same type of surprise for me. I’ve been here probably five of the last seven times I’ve been to Oak Park and it’s always great food. It’s a must visit for sure. It’s even worth a drive out from the city as a destination. Posted in food on 2013/03/10 by John.